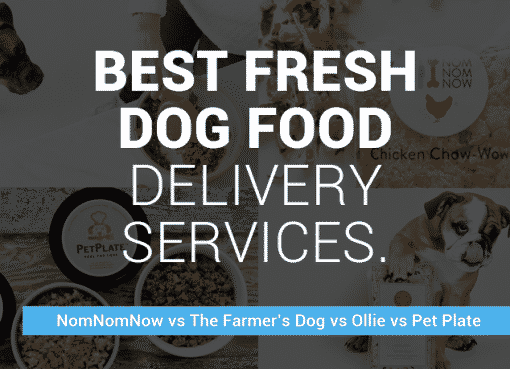 NomNomNow is our favorite option for fresh dog food delivery. Portion-sized resealable bags, excellent variety in recipes, high quality ingredients and freshness, and competitive pricing. What else can you ask for? NomNomNow.com is a subscription dog food delivery service that not only focuses on delivering fully customizable meals directly to your door, but also promises to provide human grade, restaurant quality ingredients in every meal. Like many other subscription services on the market, NomNomNow offers users the ability to have a say in the ingredients that go into every bag of food, but with the added bonus of a trained veterinarian helping to make your decisions with you. As it turns out, Dr. Justin Shmalberg has input on every new formula the company creates, and he provides helpful advice to company execs to ensure that only the healthiest meals possible make it out of the factories and into the mail trucks. Trial offer: NomNomNow is offering Woof Whiskers readers 30% off your first order when you order through this link or the button above! The discount is automatically added during checkout. 1% of all sales also goes directly into pet nutrition research, so you can rest assured that at least a portion of your bill goes into helping pets live longer, happier, healthier lives in the future. Unboxing our first order of NomNomNow, with a spectator watching my every move. Our first shipment arrived safe and secure in a heavy-duty brown shipping box with the company’s logo and messaging stating to refrigerate the contents as soon as possible. We tried the trial order of the Chicken Chow-Wow recipe (more on the recipes below) which contains a total of 14 bagged meals. Opening the box up, you’ll find the food safely wrapped up between two large reusable gel ice packs. Everything was really cold inside still after shipping, but you’ll want to be sure to get these in the refrigerator quickly. All food is made and shipped from San Francisco, and since it made it all the way to Pennsylvania in the summer still being cold you can rest assured the food shouldn’t come anywhere close to spoiling during transportation! The packaging states that you should use or freeze these within 8 days of receiving them. So if you order a larger pack, or if you’re feeding half fresh food and half kibble, you’ll want to freeze a few of these. Frozen packs of food can last up to 6 months and can defrost in 24-48 hours in your fridge as they are needed. This shows a close-up of the Chicken Chow-Wow recipe. I simply ripped the pouch opening and poured it in her bowl, straight from the fridge. As mentioned, one of the things that really sets NomNomNow apart from the pack is the fact that every formula is strictly guided by a University of Florida trained, board certified veterinarian. Thanks to his input, pet parents can rest assured that only the most nutritious ingredients available are being fed to your pup at every meal time. 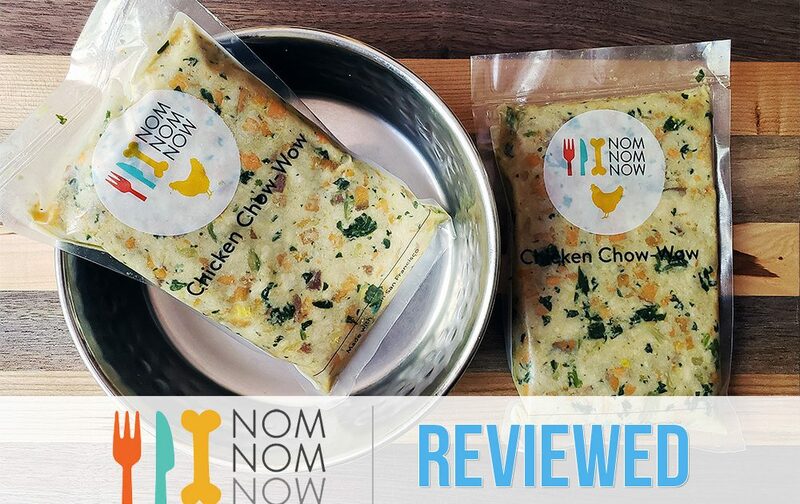 To make the food even more appealing to health-conscious pet owners, NomNomNow pledges to go “above and beyond” when it comes to selecting high quality ingredients, and pre-portions every meal to perfectly suit your dog’s unique individual requirements. Just looking at the food, I was impressed with how high-quality everything seemed. This looks like a recipe I would use to make turkey burgers! I can see all of the ingredients plain as day in front of me, the vegetables and meats are all there are look delicious. Certainly more appetizing than kibble. At the time of this review, NomNomNow has 5 excellent recipes to choose from. Let’s take a look at each recipe’s full ingredient list and estimated nutrient analysis. Update: At the initial time of our review, NomNomNow also sold a veggie option called “Egg and Veggie Medley” which was aimed for dogs with meat allergies. However, it appears this is no longer an option so we will not analyze the ingredients. NomNomNow’s Beef Mash is on the higher end of fats and lower for protein when comparing their other recipes. Overall, the nutrient profile is much better than kibble and meets all AAFCO feeding guidelines. NomNomNow Turkey Fare is our favorite recipe. We personally like the higher protein and lower fats in this one compared to the Beef recipe. In addition, the nutrient profile isn’t that far off from some high-end kibbles, so transitioning should be easier. NomNomNow’s Chicken Chow-Wow is the lowest carb offering. You may need a longer transition period if your dog is currently eating a kibble with high carbohydrates. NomNomNow Pork Potluck is nearly identical to their Beef recipe in terms of nutritional analysis. The company also cooks all of their foods in their own specialty kitchens, where chefs prepare your dogs foods with only the freshest ingredients and with all the care that we might expect to see in a high-end restaurant. This fresh ingredient diet, according to the company website, may require a brief adjustment period as your dog gets used to the new food, but that’s perfect normal anytime your dog switches foods as their stomachs need some time to adjust. Pet parents just need to stick to the program, and they will start to see the results in no time. Very seldom do dogs actually have issues. Here’s a look at a veterinarian talking about the Heartland Beef Mash recipe to give you a feel of what all goes into a bag of NomNomNow. I’ll be honest, my pup Sasha is not a picky eater. With that said, I can tell when she REALLY likes something versus simply eating it because it’s in front of her. As soon as I brought the box inside, she could smell it and was right by my side the entire time until I finally let her try it. I grabbed her bowl, tore the package open, and squeezed the food out. The middle was still semi frozen, so I used a fork to break it up. Afterwards, I let her at it, and she LOVED it. A member of the “clean bowl club”? You bet! Who wouldn’t rather eat this fresh food instead of crusty kibble? Note: my dog was already pretty accustomed to fresh dog food, due to her previously reviewing a few other companies including Ollie and Pet Plate. If your dog currently eats kibble full time, you’ll want to be sure to transition their diet to fresh food slowly. Luckily, NomNomNow does this step for you and prepackages smaller portions for the first week or so as your dog transitions (half NomNomNow and half kibble). The best part of feeding your dog this fresh dog food is you simply rip open the package and put it in the bowl, there’s no measuring involved. The folks at NomNomNow portion out every bag to have the perfect amount of food for your dog’s ideal body weight, so you can put the kibble measuring cups away. NomNomNow does offer a sample box, which allows potential customers to receive four meals for only $14.99. If pet parents decide that they want to move on and place a full order, they can also head over to the company website where they are asked to enter their pets weight and target weight, then pick one of five different recipes for their next box. First time users are given an extra perk too, receiving 50% on their initial order. From then on, customer are billed monthly, receiving an insulated, cold box of fresh food on a regular basis until they decide to cancel their subscription. The cost of NomNomNow is discussed more below, but the price will vary a good amount based on the size of your dog and how often you want shipments (discounts for receiving more food at a time). And, while the allure of fresh food created by a trained vet might in itself is appealing, NomNomNow goes one step even further. Curious pet parents can also sit for a virtual consultation with a certified pet nutritionist, who will help them to make the right choices and answer any potential questions about switching over to the new food. NomNomNow launched as a fresh dog food delivery company, and that was their only product. 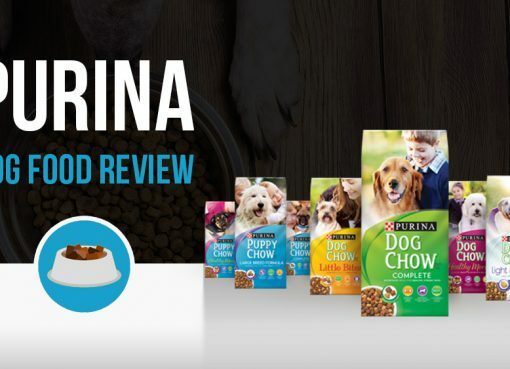 As the company and industry continued to grow, their success allowed them to launch new products focused on pet health. We also had the opportunity to review a few of these. Let’s take a look at each one. Zero preservatives and one ingredient… chicken. Following NomNomNow’s mission of only using fresh, real ingredients, NomNomNow jerky treats are made with one single ingredient. There are two types of treats: beef or chicken. I would list the ingredients of each, but that would be a short list. Both are simply dehydrated USDA Certified meats, so the ingredients are either – you guessed it – beef or chicken. Take a look at this photo we took which shows the chicken jerky. You can actually see a full chicken breast that was sliced super thin. 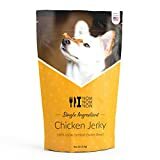 We absolutely love these treats and continue to buy them from Amazon for Sasha. One thing I’d like to note though is to take caution if you have a frantic eater. If your pup is one to eat super fast and not chew very much, I’d recommend breaking it into smaller pieces. Check out our full NomNomNow Treats review here. The latest product launch from NomNomNow is their Microbiome testing kit and probiotic supplements. The Microbiome kit analyzes your pet’s gut health through stool analysis (don’t worry, you only swab it!). It gives great insight into how your dog is performing on a given food, whether they are prone to allergies or constipation, and many more. 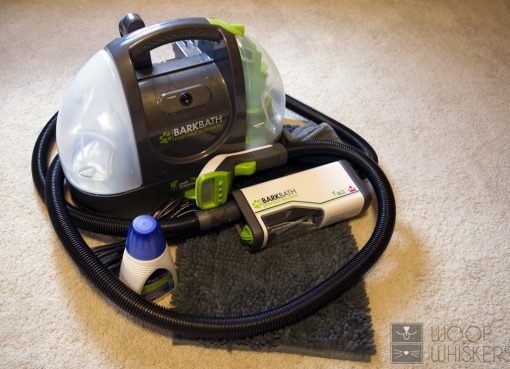 Check out our full review here for more details. The kit is very easy to use and contains a prepaid envelope to mail back. This is a great offering by NomNomNow for new customers who are looking to switch from a kibble diet to fresh dog food. Its usually obvious that a fresh diet is better than kibble in the long run; however, many dogs can have sensitivities to such a drastic change in diet, which is why it is very important to slowly transition from kibble to fresh. If you plan on transitioning, it’s a great idea to order a Microbiome kit before AND after. That way you get a baseline of your dog’s gut health and have something to compare with once you test again when switched to fresh. If you complete the Microbiome kit and see that your dog is low in healthy bacteria, you can order their Probiotic supplement. This is very easy to administer on a daily basis – all dogs get 1 scoop per day, regardless of weight or size. While we love ALL animals here at Woof Whiskers, we primarily focus on dogs, so we did not test or analyze NomNomNow fresh cat food. They currently offer two recipes: Chicken Chow-Meow and Flavorful Fish Feast. From a quick research, it appears some cats have a harder time transitioning to fresh food than dogs. As a result, I’d highly recommend order a trial pack for your cat instead of jumping into an immediate subscription. Switching to a new method of feeding your dog can be confusing, so here’s some common questions we see around NomNomNow and the answers. NomNomNow pricing varies based on how often you want your food deliveries to arrive (1-4 weeks, bigger discounts for getting 4 weeks of food at a time) and how big your dog is (bigger dogs need more food!). 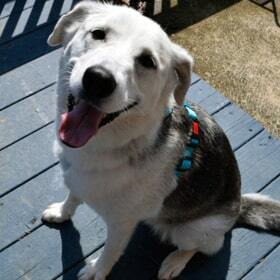 Also if you are ordering for more than one dog, there are additional discounts that can apply. Below is a price chart of rough estimates of what you can expect to pay per week based on the size of your dog. Keep in mind this chart is accurate as of late-2018, but prices may change in the future. Can I feed a puppy NomNomNow? Yes, NomNomNow is designed with puppies in mind! What’s also great about using NomNomNow with your puppy is you enter in your dog’s age, current weight, and estimated adult weight. NomNomNow will do the math in calculating how much food your puppy needs as it grows and continue to deliver perfectly portioned meals without a ton of guessing, measuring kibble, and all of that junk. As you keep your dog’s weight up to date on their profile page, NomNomNow will continually adjust the portions as needed to make sure your dog is growing at an optimal weight. Can my dog switch between NomNomNow recipes without a lengthy transition? Yes, with fresh dog food you can typically rotate dog foods easily without upsetting your dog’s stomach. NomNomNow even has a “Recipe Rotation” feature that will send you a different recipe each time you get a package. If your dog is a picky eater that gets bored with food easily, this is a great way to keep your dog’s interest. If you tried doing this with dry dog food, you’d constantly be transitioning between different dog foods at different measurements which would be hard on your dog’s stomach and a waste of time for you. Are NomNomNow Recipes Gluten and Grain Free? All recipes are gluten free, and most recipes are grain free (Heartland Beef Mash, Chicken Chow Wow, and Porkalicious Potluck are all grain free). Other recipes may use high-quality grains like brown rice. No low-quality grains are used in any recipes like you sometime see in dry dog foods. How do I store my NomNomNow food? In the fridge or in the freezer? It depends on how much food you are ordering at once. Since NomNomNow doesn’t use any artificial preservatives in their food, it’s best to only keep one week’s worth of food in the fridge and put the rest in the freezer. Frozen meal packs take up to 48 hours to defrost, so once you’re down to your last few days of food in the fridge, start moving some meal packs from the freezer to your fridge to defrost. Since the meal packs are vacuum sealed, they remain fresh for 6 months when unopened and frozen. How old is the food that’s mailed to me? NomNomNow cooks their food every weekend and ships the food out at the start of the week, so the food you’re receiving was cooked just a few days ago every time you receive a shipment. The food truly is “fresh”. Where is the NomNomNow food made? All food is made in a commercial kitchen in the San Francisco area that’s 100% owned and operated by NomNomNow. This is actually a pretty big deal, because other dog food companies may be using a shared kitchen space and you don’t know what they’re cooking in the same facility or if they know that food standards are being upheld. What are the Downsides of NomNomNow? Nothing in this world is perfect (except maybe your own sweet doggo), so let’s talk about some of the reasons you may want to not use a fresh dog food delivery service. The first and biggest one is the price. Just like the food that humans eat, getting fresh, higher-quality dog food is going to cost more. If you have a small to medium sized dog then the cost isn’t too bad to adsorb (see the pricing table shortly below), but if you have a large dog or multiple dogs then the cost can add up and become too expensive for some households. Another potential drawback is this will require some space in your refrigerator and freezer, so if your fridge is already packed it’s something to consider. If you can order and store a month’s supply at a time you get a bigger discount, and again if you have a large dog or multiple dogs then the packs of food will be larger and require more room to store. Personally I prefer having NomNomNow in the fridge than a big bag of stinky kibble sitting in my kitchen that I always have to unroll, dig in to, and re-roll shut tight enough so the kibble smell does take over my house! If you have any other questions, thoughts, or comments about our NomNomNow review, be sure to leave us a comment below and we’ll get back to you as soon as possible. Your 30% off link goes to a 20% off offer on their site. Do you receive any benefits from this company? Thanks for the comment, we looked into it and the links should work as stated now with the intended 30% offer. Yes we may receive benefit from the majority of products written about through referral sales (Amazon or other), it’s how we can afford to operate and the only source of income since we do not accept payment for direct manufacturer advertising. We pride ourselves in creating genuine reviews regardless of referrals.